The fun did not stop for us after The Festival of Dankness in San Diego! We hopped on a flight north to Portland, OR for our first "fresh hop" harvest! This year we were lucky enough to secure a bunch of fresh Strata hops from Goschie Farms outside of Portland, OR. These 3rd generation farmers at Goschie Farms are currently in the middle of their 114th hop harvest! They were extremely accommodating and gave us a tour of their entire operation! 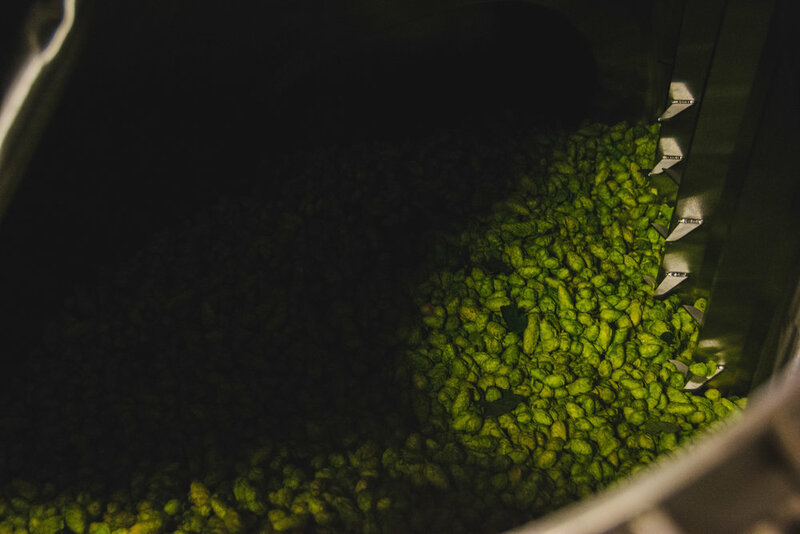 Let's dive a little deeper into what exactly "fresh hops" mean. "Fresh hops" are picked from the bine (not a typo, it is BINE) early in the morning, processed and put into a beer within 24 hours of harvest (which is roughly the expiration date of "fresh hops"). 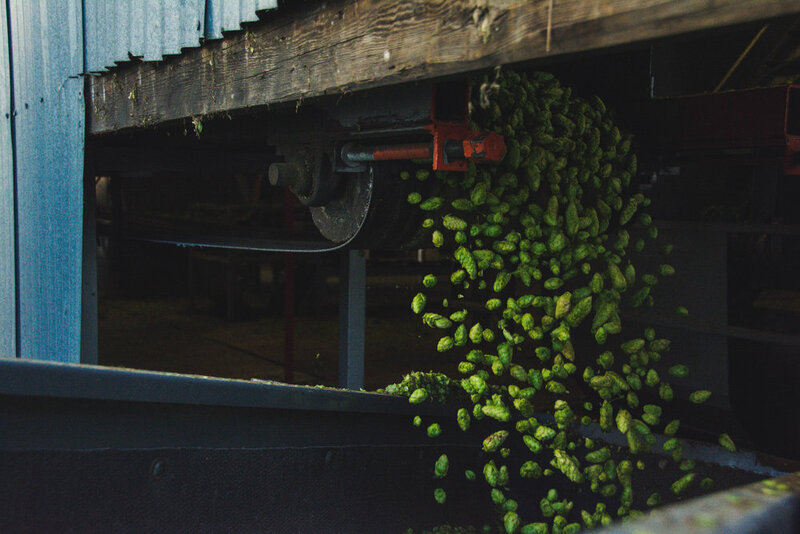 You may hear some brewers use the term "wet hops", these are essentially "fresh hops" that have skipped the kiln-drying step on their way to being processed. There are some unique factors that we have to take into account when brewing with "fresh hops." "Fresh hops" are less potent than hop pellets, so it takes many more whole cones to achieve the same flavor than if we were to use dried pelletized hops. "Fresh hops" also impart more floral, grassy notes without all the bitterness that we associate with those IPA tasting notes. The only issue with getting "fresh hops" harvested in Oregon is transporting them back to Tucson, AZ in time to use them in a beer (24 hour expiration, remember!). The solution to this problem was to link up with the folks at the Modern TImes PDX brewing facility and brew a beer together! Once the hops were processed and bagged, we loaded them into our truck and drove them back to Modern Times where the beer was already mid-boil. We then added the fresh Strata hops (at a rate of 16lbs/bbl) to a secondary vessel during whirlpool and pumped the wort on top of them. Once all the wort was pumped on top of the hops, we immediately knocked out into the fermenter. 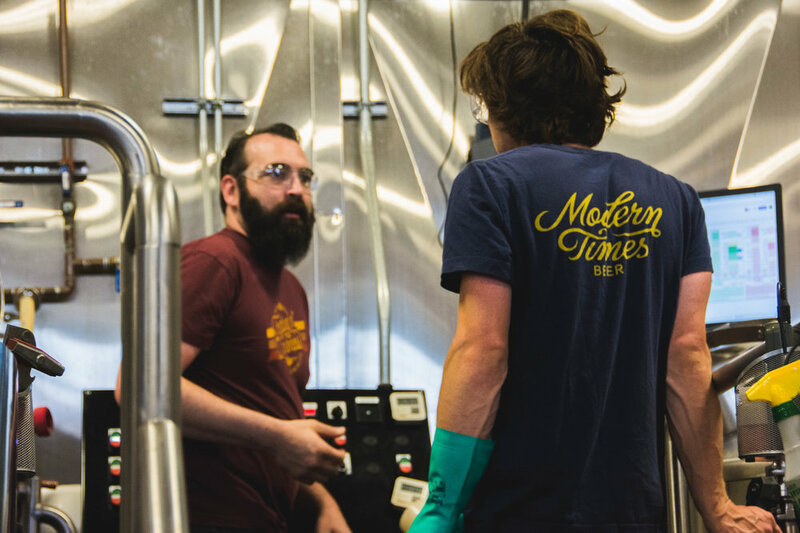 We had an absolute blast brewing with the fine folks at Modern Times PDX, they are clearly passionate about pushing the boundaries of the beer industry and we had some great discussions about how we can continue to do so in a collaborative manner. Our collaboration beer, which we named, "Arcosanti" is an IPA brewed with Lamonta Pale Malt & Shaniko Wheat Malt from Mecca Grade Estate Malt in Oregon. Hopped in the whirlpool with fresh Strata hops and dry-hopped with Strata & Citra pellets. Due to Arizona liquor laws, we will not be able to pour this in our taproom in Tucson, BUT kegs of "Arcosanti" should be arriving at a handful of beer bars around Arizona in the middle of October and the Modern Times PDX location will, of course, have plenty on tap if you happen to be in that area! Following our Instagram or signing up for our newsletter (below) will be the best way to find out when and where you will be able to enjoy "Arcosanti"